It’s only a short review of Leo Fall’s Die Kaiserin, I’m afraid. It was too depressing to write more. I won’t even mention the orchestra who appeared to be sight-reading, let alone the lack-lustre conducting. People around me fell asleep. Many did not last till the end. One was sometimes waiting 20 minutes for music, and the dialogue was so pedestrian. Not the best ingredients to make for a great operetta performance. 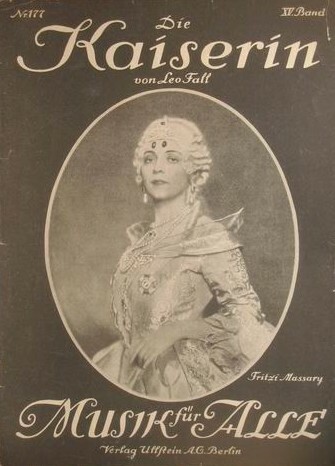 Brammer and Grünwald’s libretto for Leo Fall’s 1915 operetta is based on the play Maria Theresia by Franz Schönthans. Its origins are obvious as, although the work lasts 160 minutes (plus interval), there is but 50 minutes of music in all. 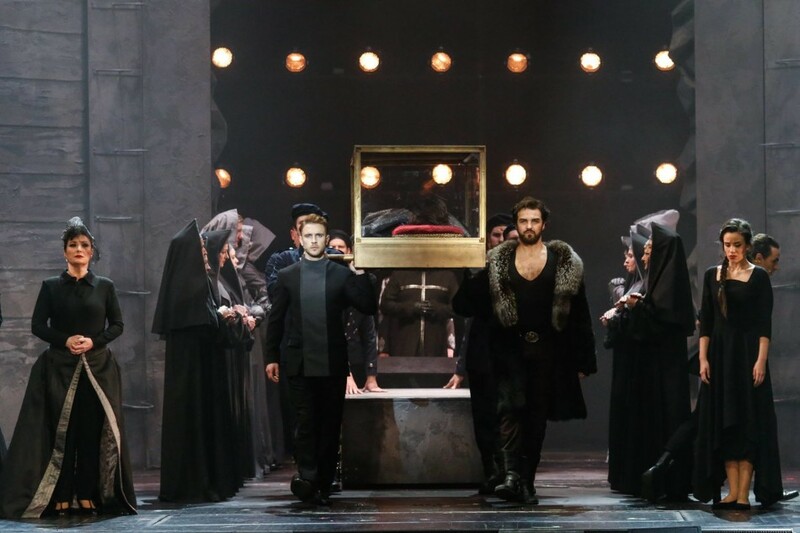 Fall presumably set out to produce a serious operetta as there is very little humour in the piece, at least as presented in the current production by the Stadttheater Baden bei Wien. 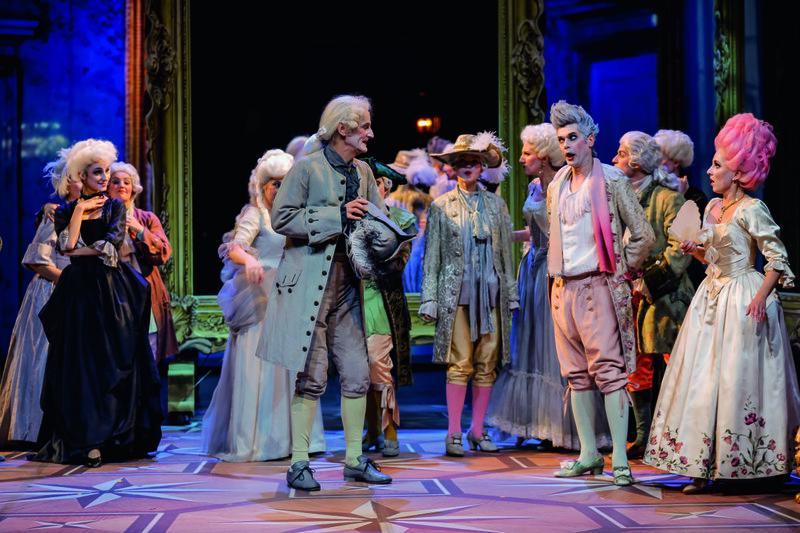 There are various ‘faults’ in the show’s construction: the soubrette pair do not appear until the middle of Act Two, and then are given very little to do. 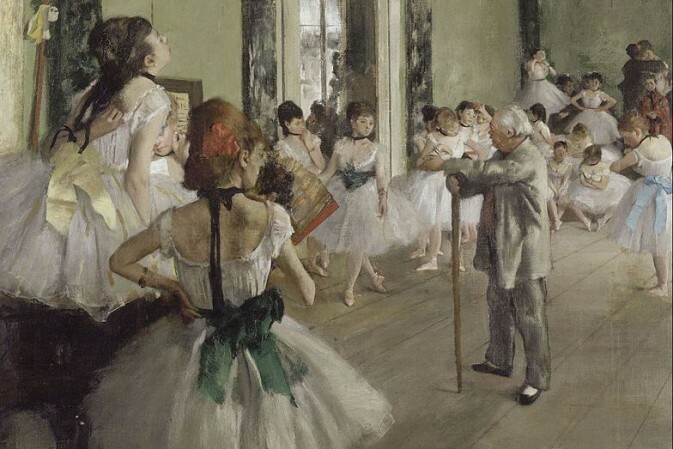 Fall was clearly trying to avoid the use of the waltz, which had not been ‘invented’ in the time of Marie Therese, and the only memorable danceable one does not occur until Act Three. Unfortunately his use of pastiche 18th century rhythms and dances is nothing like as successful as his British contemporary, Edward German. Considering that the Empress had a very fully and dramatic reign, if only as the only female Habsburg and the only one who was not allowed to assume the title of Holy Roman Empress, and finding the treasury bankrupt on the day of her coronation, the dialogue is , frankly, dull. At least the way it’s presented in Baden. Most of the time it consists of pedestrian duologues between MT and her husband, Franz Stephan – himself second choice after his elder brother had died! Both major roles need first rate singers who can handle dialogue. (You might recall that Fritzi Massary was one of the star-performers of Marie Theres; a sublime Leo Fall interpreter.) Baden’s Miriam Portmann has a lovely soprano voice which she uses to effect in ‘Zwei Füsserl’ and the soaring showpiece aria ‘Du mein Schönbrunn’ and her huge slow waltz duet with Franz, but she is hampered by apparently wearing the same white costume throughout, even though about 30 years pass during the course of the show: clearly she is supposed to be ageless! 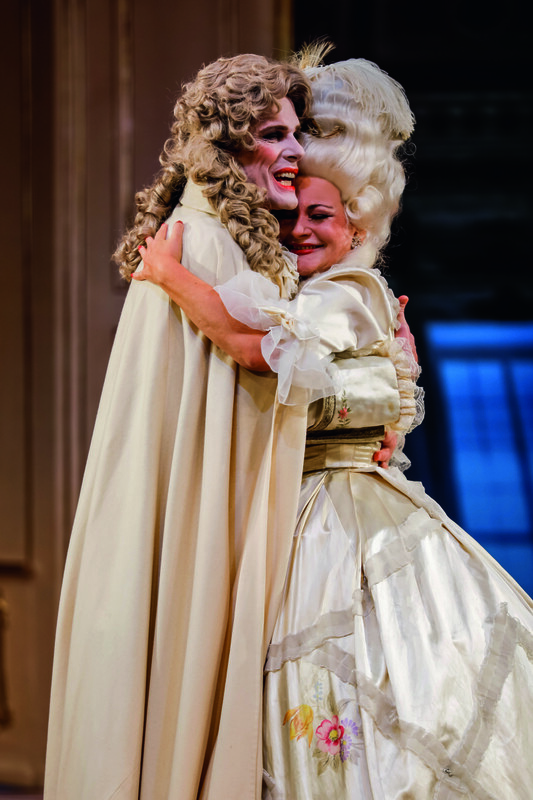 Franz is played by Reinhard Alessandri, who does not easily cope with the high tessitura of the role: all the notes are there but it is clearly hard work! His rendering of ‘Dir gehört mein Herz’ does not erase memories of Rudolf Schock, who made it sound easy. He is also hampered by seemingly wearing the same white costume throughout. Various secondary roles are well taken, notably Eva Maria Marold as a brooding Gräfin Fuchs, with a swan on her head. (Why, I wondered?) Direction is by Leonard Prinsloo, who has not succeeded in bringing Die Kaiserin to life: perhaps this is not possible? Costume design is by Devi Saha, clearly working to a budget. 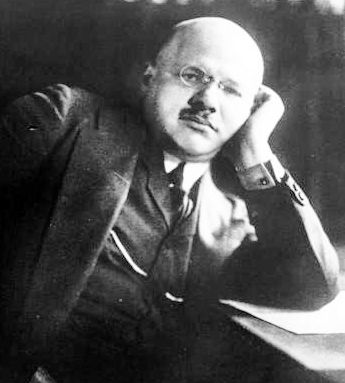 Composer Leo Fall in 1915. The most successful aspect of the production is the imaginative and inventive set designs by Su Pitzek, using projections of palaces in Vienna and moveable mirrors/portraits. One of these portraits is of the Empress dressed in a gorgeous green gown: if only this could also have been one of the costumes! This was a worthy effort: many operettas, given an imaginative production by a director, come up fresh as paint. Not this one I am afraid, at least not with the cast and conductor and stage director. Judging by the video trailer the music sounds rather ‘memorable’ to my ears, even if the performance could use a little more bounce. But it’s still catchy Leo Fall…. that with the right singing actors and conductor can easily sweep you along. This does sound like a depressingly bad evening, alas, but the score really shouldn’t be unmemorable. Like all Leo Fall, it is full of wonderful things that are delightful even when I pound through the vocal score at the piano. I’m sorry to read this lovely music didn’t come through in the production. I love this score! Great tunes right from the get go! I cannot vouch for the production, but I can say that Leo Fall wrote a great score. The reviewer should be thrilled that he was able to hear the score live, let alone see the show as well. Is it possible that the reviewer didn’t know the score? He mentions Schock but then trashes the music in his review- perhaps he should have recused himself and let someone with a more open mind review the it. We would all be better served in this manner. From the many conversations with John, I’m pretty sure he has an open mind. It’s unfortunate that he had to sit through such a boring production. His verdict on Fall is simular to what happens with with the many CPO releases: critics hear these rarities and believe they are boring and not worth reviving, just because the modern-day recordings are such a bore. (Often.) Yet, even though this applies to nearly all such performances and CD releases, few companies dare to do it differently. I do know the score: I have the Emmy Schlemm/Franz Fehringer/Franz Marszalek 1953 recording – there is only 50 minutes or so of music on the CDs and there was only 50 minutes in the 160 minutes of the show as performed at Baden! It really seemed like a play with the occasional song! It would be interesting if Gerald and Tony were to see this same production and air their thoughts on ORCA. I was very disappointed, if only because the previous evening’s operetta, Maske in Blaue, had been superb!